This incentive scheme rewards you both cash and hourly rental credits for the trips while on the road! Tip: All hours count, so drive as much as you like! Relief Drivers included*! If Mr Tan completes 100 trips this week, he will earn $200 ON TOP of his fares and $30 in Hourly Rental Credits! The more trips you complete, the higher your reward. 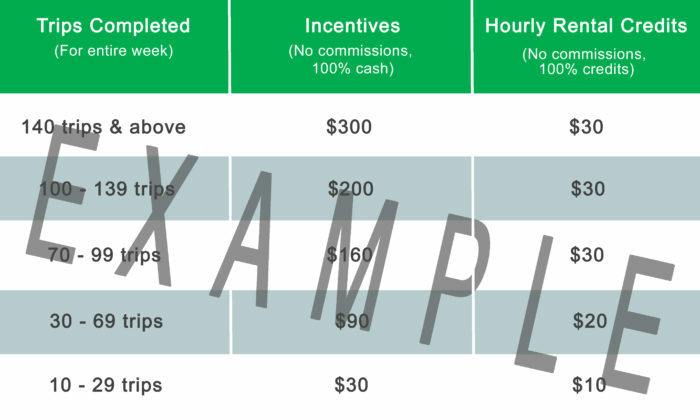 100% of your incentive will be paid in Cash. Hourly Rental Credits only apply to Drivers who rent from Tribecar or WhizzCar. Relief Driver Incentives are only eligible for Relief Drivers who joined GrabCar under the “Share your ride” program. Eligible fleets are GrabRentals, Exclusive Fleet Partners and Own Car. *Please be informed that Relief Drivers will be eligible for special incentives only, and will not be entitled to the credits payout. For example, as Relief Driver A completes 30 trips, he will only be receiving $90 cash, as opposed to $90 + $20 credits payout. Eligible trips are unique passenger trips on GrabShare, GrabCar Economy 4 & 6-seater, GrabCar Premium 4 & 6-seater, GrabFamily 4 & 6-seater & JustGrab. Trips done using vehicles owned by other ridesharing platforms do not count. In order to achieve Tribecar/WhizzCar credits payout, Drivers must fulfil a minimum 1TPH (trip per hour) per Tribecar/WhizzCar booking hour.